Made of cuddly soft organic cotton and just the right size for teeny hands to grab. When you find a good friend, hold on to them. No, literally: Hold onto them. 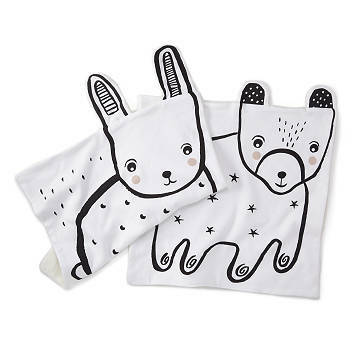 Give this sweet bunny or bear to your little one and watch them become the best of buds. The blankets are made of cuddly soft organic cotton and just the right size for teeny hands to grab. Together, they'll go on so many adventures together—naps in the crib, naps in the stroller, even naps while the adults have dinner. (Hey, we can dream, can't we?) Made in India.